Students and newly credentialed school psychs can receive cash to attend CASP Convention 2018! Great news! CASP has extended the Paul Henkin/Suzanne Fisher Scholarship deadline to September 1, 2018. 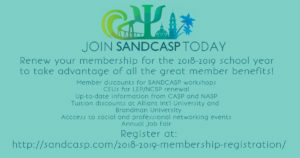 This annual award given to CASP members is awarded to one graduate student in school psychology and one newly credentialed school psychologist (someone who has received a credential within the last three years) up to the amount of $750 to be used to attend the annual CASP convention. ← SANDCASP is now accepting your suggestions for next year’s workshops!